Razor-thin profit margins and minimum wage increases have pushed a growing number of restaurateurs to diversify their revenue stream by implementing private events programs at their restaurants. But while many restaurant owners have dove in head first offering events, the traditional management processes they’re using are costing them both time and money. From clunky binders to manual filing systems, far too many restaurateurs still rely on outdated management methods to plan and manage their events. Here’s how technology is streamlining that process, making events more enjoyable for clients and guests. Traditional event management techniques don’t exactly lend themselves well to organization. Have more than a couple of events lined up for next week? Chances are your desk is a mess of pages and pages of updated documents. The good news is that cloud-based software can help clean things up. By tracking invoices, bookings, menus and more, cloud-based software enables you to access and update almost any event-related details from one easy-to-use platform. When it comes to keeping your team organized, event management software has you covered. You can send daily emails through the platform to keep team members on top of upcoming events or details they should be aware of, which helps ensure everyone knows what to expect when they come into work each morning. Getting your front- and back-of-house staff on the same page is no easy task, especially as your restaurant grows. But if you want to seamlessly execute one event after another, no piece of information – however big or small it may be – can risk going unnoticed. That’s where event management software can make all the difference. Instead of scrambling to make sure everyone on staff knows about an updated booking, implement software that enables your staff to communicate across channels and through mobile devices. This type of technology will alleviate much of the stress and confusion tied to coordinating with your staff on events, accounts, leads and contacts. Hungry for more ways to enhance communication with your restaurant staff? Consider trying out event management software that offers the ability to tag specific team members in your messages. Since front- and back-of-house staff members will be instantly notified of important updates, you can hold them accountable at every stage of the event planning process. In addition to keeping your staff in the loop, effective event management software also promises to share all the latest developments with your guests through intuitive messaging platforms. With a complete history of all correspondence at your disposal, you’ll never be left wondering what you have or haven’t discussed with a guest. Originally created in 2004, Payments Card Industry data security standards (PCI DSS) have since led the fight against credit card fraud. By implementing event management software that already features a PCI DSS compliant payments system, restaurateurs like you can help do the same. Similar to Amazon, PCI DSS also facilitates seamless transactions in which diners can enter their card information once and then proceed to repeatedly charge that same card without reaching for their wallet. Since all restaurateurs must comply with PCI DSS or risk being fined, choosing event management software that already follows such standards can save your restaurant money while also improving convenience. If you’re looking for leads, event management software may be able to point you in the right direction. An automated booking inquiry widget is one of many tools event management software uses to consistently capture leads. By giving prospective clients the opportunity to make requests on your website anytime, day or night, the automated booking widget is working even when you’re not. Additionally, more restaurants are turning toward tech to convert those leads into bookings. Digital proposals open the door for a quick lead turnaround while e-signatures enable clients to confirm a booking within minutes. Event management platforms also have tracking and data analytics features to help managers gather insights and improve their event offerings. More and more restaurant owners are turning toward private events to help fend off shrinking profit margins and steady wage increases. But in order to build a secondary revenue stream from hosting private events, restaurateurs must first choose the right technology and event management software. By automating organization and communication, securing payments, and increasing leads, technology is helping a traditional, old-fashioned industry save valuable resources and move into the 21st century. 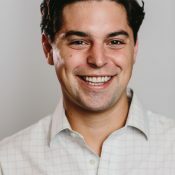 Alex Lassiter is Co-founder and Vice President of Customer Experience of Gather, an event management software for thousands of restaurants and venues. Gather enables restaurants, venues and hospitality companies of all sizes to manage and grow their events business, serving as the anchor between management, events teams and their customers.